that begins from July 13. All matches will be played at the Queens Sports Club in Bulawayo. The matches will be played at 07:15 AM GMT / 09:15 AM Zimbabwe local time. Get all the information on the Zimbabwe vs Pakistan schedule, squads, news and results below. It will be a continuation from the Tri-Series in the T20i format which had seen Pakistan thump Australia in the final thanks to a Fakhar Zaman masterclass. He failed to get to a century but ensured that Pakistan had chased down a tough Australian score to lift the title. Earlier, Pakistan had lost to Australia in one game but won the remaining three matches, including a win over the Aussies and two thumping victories against Zimbabwe as well. 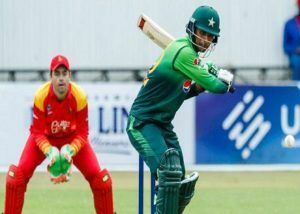 Going into this series versus the hosts Zimbabwe, there is no doubting that Pakistan will be overwhelming favourites to win the series 5-0, given how poorly placed Zimbabwe is in not just the ICC World Rankings but also because of the loss of their top players because of non-payment of dues. Zimbabwe will continue to be led by Hamilton Masakadza but any hope they had of giving Pakistan a fight looks to have receded with the loss of Solomon Mire. Mire was the one standing light during the tri-series but he has injured himself an won’t be taking part in the series. Pakistan has no such issues and is playing a full-strength side in a bid to prepare for the 2019 World Cup.